The Carr Fire in Redding, California has brought devastation to the Northern California region. Many people have had their homes destroyed or damaged, and tens of thousands of individuals and their families and pets are evacuated. It’s clear that the region will need assistance as those living there and the communities impacted by the fire get back on their feet and heal from this terrible wildfire disaster. What’s happening with the Carr Fire in Redding, California? At the time of publication of this list, the Carr Fire in Redding, California had reached 98,724 acres and was 20% contained. There were a number of mandatory evacuations still in place. If you are currently in the area where the Carr Fire is active, you can find up-to-date coverage from KRCR News Channel 7, as they have been providing complete coverage despite being evacuated from their news studio. You may either donate through the American Red Cross website or you can text REDCROSS to 90999 to donate $10. If you’d like to help an individual family or two in need, you can check out GoFundMe’s list of verified campaigns for victims of the Carr Fire in Redding. The Haven Humane Society has been taking in evacuated animals and pets. They’ve been receiving many in-kind donations. They are in need of a generator to run AC in one of their buildings. For the latest updates on their needs, please check out the Haven Humane Society Facebook Page. They also have information for how you can get involved volunteering with their organization. Donations to Haven Humane Society can be made here using the PayPal button, or they can be mailed to the address on this page. The Salvation Army is taking donations of NEW pillows and blankets, water and sports drinks, baby items, cleaning supplies like Clorox wipes, and any size and gender t-shirts, socks and underwear. They don’t list it, but you may want to call and see if they are in need of diapers. Physical donations can be taken to Salvation Army at 2691 Larkspur Lane in Redding. You may also donate money to the Salvation Army online. 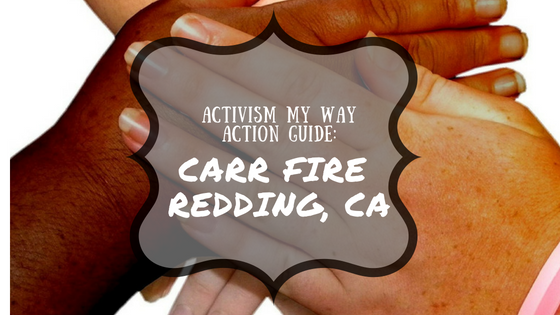 Be sure you choose “Redding, California” as the location to make the donations to. The Shasta Regional Community Foundation has set up a community disaster relief fund. This foundation provides grants to nonprofit organizations and governmental organizations to help those who are most in need. 100% of the money donated goes to Carr Fire recovery efforts. The Tri Counties Bank, a local bank chain, has established the 2018 Carr Fire Fund. If you live in the counties served by Tri Counties Bank, you may make monetary donations in person at the branches. You can find a list of branches on their website, here. You can also make donations to Carr Fire recovery through the Go Fund Me set up by the bank. The United Way of Northern California’s office is currently evacuated, but you can still donate money by texting CARRFIRE to 91999 or heading to the website, here. CalFire has asked rather than donating water or supplies to firefighters that those in the community instead make signs thanking the firefighters for their efforts. Facebook has set up its crisis response app for the Carr Fire. Victims of the fire can find information here about what the latest news is. They can also mark themselves “safe.” There’s also a “support” tab where interested parties can donate to relief efforts or find or give help to others affected by the Carr Fire. Is your organization helping Carr Fire recovery efforts? Please let me know, and tell me how readers can get involved, and I’ll add the organization to the list.